Thank you for your interest in the Orlando Magic Internship Program. We believe that our internship program is one of the most comprehensive in the sports industry. Those who are selected to be Orlando Magic interns will acquire practical knowledge through hands-on experience and gain invaluable skills necessary to compete for careers in the sports industry when the program is completed. We currently offer over 21 different opportunities in a variety of departments. Office Hours - M-F, 9:00 a.m.-6:00 p.m.
Training Camp is a monthly get together for the interns. Each month, the interns get the opportunity to sit down face-to-face with a member of the Orlando Magic Leadership Team and hear their career story, career advice in addition to an interactive question and answer session. We also provide a workshop on resume writing and interviewing skills. 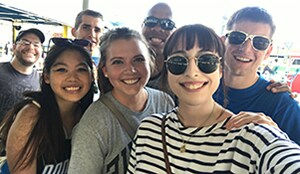 Training Camp is a great opportunity for interns to bond with their fellow interns, learn more about the sports industry and network with the Orlando Magic Leadership.